Adobe has unlocked some new features in it's Adobe Stock Editorial. One of the biggest feature is an editorial collection of pictures covering a variety of subjects. We all know how frustrating it is to search for images when the search options are limited. Looks like Adobe Stock has eased that feature for it's users. You can simply drag and drop an image to get visually similar images from the original. You also have access to built-in filters like Depth of Field and Vivid Color. You should check out the pictures and videos to understand how it works. You can also subscribe to their monthly plan which starts at $29. According to Adobe, "The new Editorial collection includes photos and videos across a diverse range of subject matter, including business, politics, sports, entertainment, and more. Editorial photographs and videos connect us to the world. They serve as our guide to foreign places and cultures. They tell stories of those who do not have a voice. These visuals have been critical in shaping our understanding and perception of the world, from changing public opinion on the Vietnam war, to mobilizing an entire generation to stand up against climate change. They have the power to unite us, divide us, and create empathy – they enable us to celebrate, suffer, and mourn as one human race". Check out the new Adobe Stock Editorial Collection. You can search for High quality images with options of blur and field depth too. 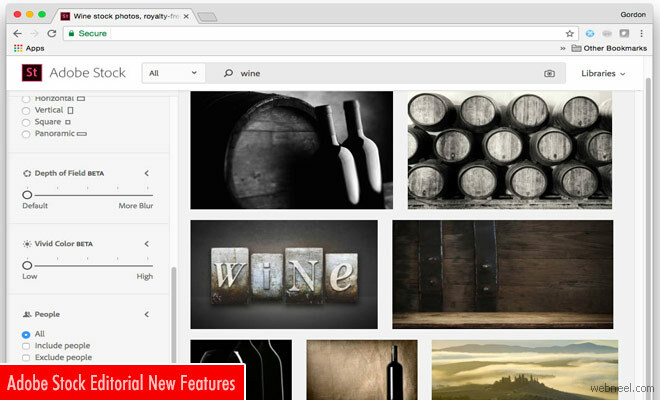 Adobe Stock Collection a whole new way to search for quality images.